provides the same performance as the previous Legend GT but in a much simpler package. Although the major components have not changed, the heat system has. The new system enliminates all of the sensors, solenoids and orifices that have been cause of service problems in the past. The Legend GT is powered by a Kohler Command 23HP air cooled engine. 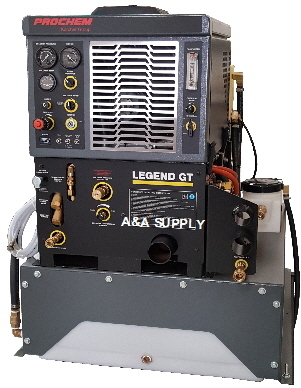 Powerful, quiet, and hot, the Legend GT is great for both residential and commercial jobs. This single wand unit is perfect for a one person operation, with a limited budget that must compete with large companies. Its high temperatures coupled with Prochem's Premium Care chemicals will clean heavily soiled carpets (200°F - 210°F). It will operate effectively with up to 350' of hose.